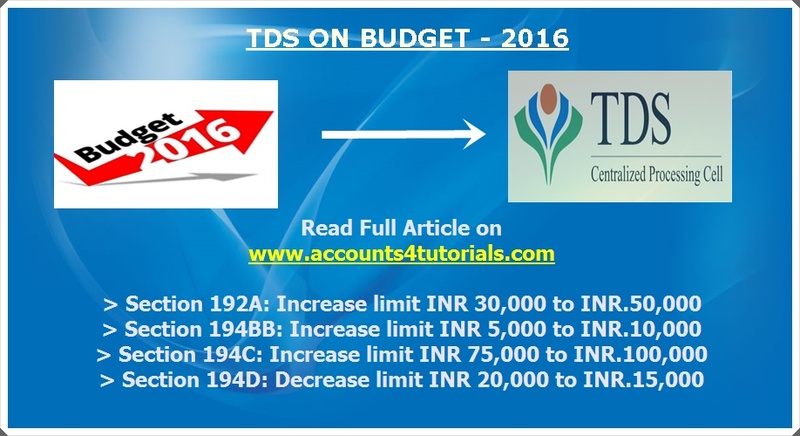 TDS Section 192A: increase the limit of INR 50,000, Section 194BB: increase the limit of INR 10,000, Section 194C: increase the limit of INR.100,000, Section 194D:decrease the limit of INR 15,000, Section 194DA:life insurance policy is changes to 1% effect from 01.06.2016. Section 192A: For the purpose of section 192A it is proposed to increase the limit of INR 30,000/- as allowed u/s. 192A to INR 50,000/- with effect from 01.06.2016. Section 194BB: For the purpose of section 194BB it is proposed to increase the limit of INR 5,000/- as allowed u/s. 194BB to INR 10,000/- with effect from 01.06.2016. Section 194C: For the purpose of Section 194C it is proposed to increase the limit of INR 75,000/- as allowed towards Payments to a contractor U/s. 194C to INR 1 Lakh with effect from 01.06.2016. Section 194D: For the purpose of section 194D it is proposed to decrease the limit of INR 20,000/- towards Payment of insurance commission u/s.194D to INR 15,000/- with effect from 01.06.2016. Section 194DA: It is proposed Under Section 194DA where TDS of 2% would be deducted by the insurer on the proceeds of life insurance policy is changes to 1% and it will effect from 01.06.2016. Section 194EE: For the purpose of section 194EE provided that any amount referred to in section 80CCA sub section (2) of clause (a) shall, at the time of payment TDS at the rate of 20% substituted with rate of 10% with effect from01.06.2016. Section 194G: For the purpose of section 194G provided that any amount paid towards commission etc., on sale of lottery tickets in an amount exceeding “one thousand rupees”, TDS at the rate of 10% substituted by “fifteen thousand rupees” TDS at the rate of 5%. Section 194H: For the purpose of section 194H provided that any amount paid towards commission or brokerage an amount exceeding “five thousand rupees”, TDS at the rate of 10% substituted by “fifteen thousand rupees” TDS at the rate of 5%. Section 194K and 194L: Section 194K and section 194L of the Income-tax Act shall be omitted with effect from the 01.06.2016. Section 194LA: On payment of compensation or enhanced compensation or consideration for compulsory acquisition of immovable property(other than agricultural land) to a resident, the payer is required to deduct tax at source @10% where the compensation or consideration exceeds INR 2 Lakhs substituted by INR 2.5 Lakhs with effect from 01.06.2016. Section 194LBB: Section 194LBB proposed with TDS shall be deducted at a rate of 10% where the payee is a resident; where the payee is a non-resident (not being a company) or a foreign company TDS rates in force on income payable to unit holder in respect of units of investment fund with effect from 01.06.2016. Section 194LBC: Further a new section 194LBC is proposed to be inserted which provides deduction of tax on income distributed by a securitization trusts to its members. The rate at which the tax is to be deducted at 25% in case of individual and HUF, 30% in any other case and rate in force in case of non-resident or a foreign company.